In January, turmoil in emerging markets, some disappointing US economic data, and continued tapering of QE by the Federal Reserve coincided with a major selloff in global equity markets. Over-extended equity valuations have made the selloff more violent. US and most other DM bond yields posted a contrarian rally, as markets increasingly focused on deflationary forces emanating from key EM economies and the Eurozone. Evidence on US growth remained solid, but there were some important disappointments in January. The December US employment report posted a much weaker-than-expected gain of 74,000 payroll jobs, but the unemployment fell to 6.7% from 7.0%. 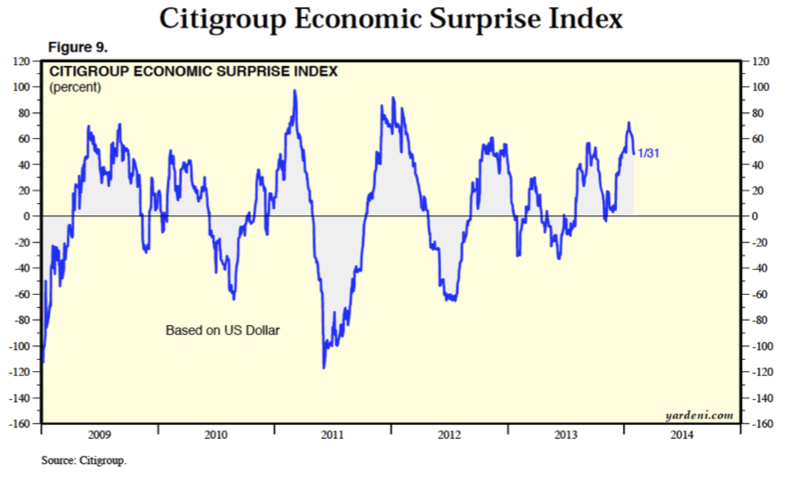 The Citi US Economic Surprise Index, which had surged into early January, fell back considerably by the end of the month. Middle East tensions remained subdued as the US-led tentative agreement with Iran over its nuclear program held together and despite the fact that Syria made very limited progress on destroying its chemical weapons and. Crude oil prices were weaker, as the WTI futures price traded down to $92/bbl in mid-January from its end-December level of $100/bbl, but rallied back to $98/bbl by January 31st. Gold prices rebounded, however, as turmoil in some notable EM economies (Turkey, Thailand, Argentine and Ukraine) spilled over into DM markets for risky assets and gold rose to $1240 after closing December at $1202. Gold and inflation-linked bonds, the worst performing assets of 2013, were among the best performing assets in January. With crude oil weakening but gold prices rising, the Canadian dollar remained on a weakening trend. The Fed’s decision to proceed with tapering, combined with the Bank of Canada’s more dovish stance, contributed to a sharp weakening of the C$, which fell 4.4% against the US$ in January, with USDCAD rising to 1.113. EM turmoil and weaker US data dented sky-high equity market sentiment in January. The S&P500 hit a record closing high on January 15, but fell in the last two weeks of the month to close at 1783 down from 1842 at the end of December. Global equity ETFs posted negative returns in January. Most major markets declined in local currency terms, but given the weakness of the C$, Canadian investors saw mixed global equity performance in CAD terms. The weaker global equity ETFs included Emerging Markets (EEM), which returned -4.5% in CAD terms, Japan (EWJ) -2.4%, and Eurozone (FEZ) -1.5%. Gainers included US (SPY), which was up +0.9% in CAD terms, US small caps (IWM) +1.6%, and Canada (XIU) +0.5%. 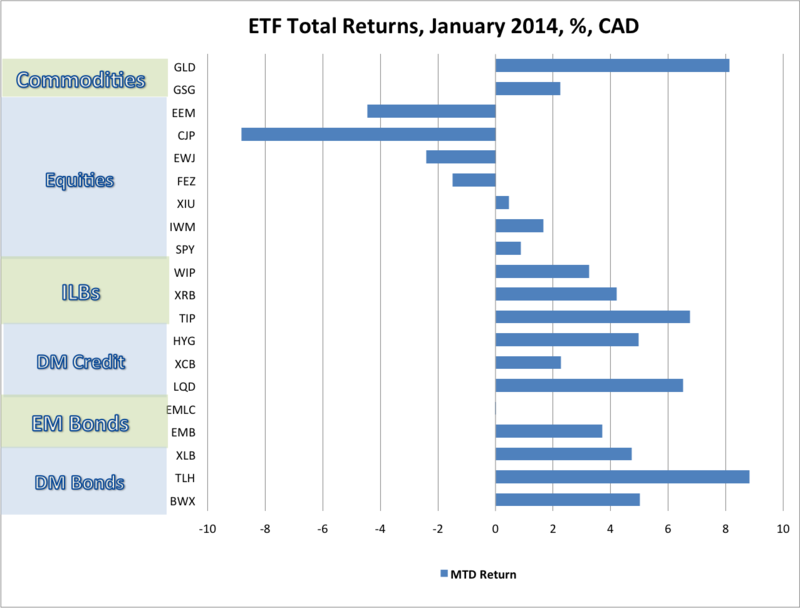 Commodity ETFs performed well in CAD terms. The Gold ETF (GLD) returned 8.1% in CAD terms, while the iShares GSCI commodity ETF (GSG) returned 2.3% as commodity price weakness was more than compensated for by C$ weakness. Global Bond market ETF returns were surprisingly strong in January, with DM bond ETFs outperforming EM bond ETFs by a wide margin. Canadian bonds (XBB) returned 2.4% in January. The best performance came from US bond ETFs which benefitted Canadian investors as bond yields fell and the C$ weakened. US long bonds (TLH) returned +8.8% in CAD terms. Non-US global government bonds (BWX) posted a return of 5.0% in CAD terms. Emerging Market bonds underperformed in January as USD-denominated bonds (EMB) returned +3.7%, while EM local currency bonds (EMLC) returned -0.02% in CAD terms as EM currencies weakened as capital was pulled out of EM assets. Inflation-linked bonds (ILBs) posted a strong rebound in January. Canadian RRBs (XRB) returned +4.2%, US TIPs (TIP) returned +6.8% in CAD terms, and non-US ILBs (WIP) returned +3.3%. US investment grade (LQD) and high yield (HYG) bonds also posted strong gains in CAD terms, returning 6.5% and 5.0% respectively. Canadian corporate bonds (XCB) returned 2.3%. In January, Canadian ETF portfolios more heavily weighted in Gold, US nominal bonds, and inflation-linked bonds, with limited or zero weight in EM assets performed best. The traditional Canadian 60% Equity ETF/40% Bond ETF Portfolio gained 237bps in January, benefitting heavily from the currency gains on its unhedged foreign equity exposure. A less volatile portfolio for cautious investors, comprised of 45% global equities, 25% government and corporate bonds and 30% cash, returned 116 bps. 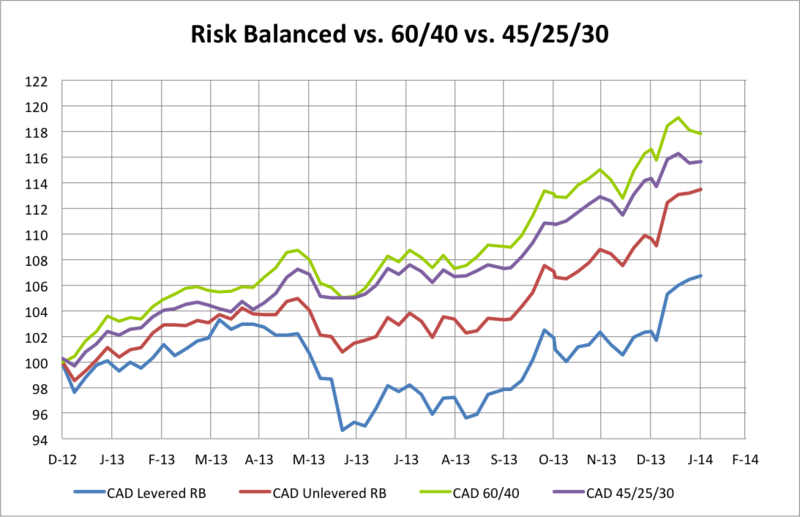 Risk balanced portfolios, which were disappointing in 2013, performed very well in January. A Levered Global Risk Balanced (RB) Portfolio, which uses leverage to balance the expected risk contribution from the Global Market ETFs discussed above, gained 424bps in January. The strong returns in the levered risk balanced portfolio were attributable to strong gains in the leveraged positions of nominal and I-L bonds. An Unlevered Global Risk Balanced (RB) Portfolio, which has less exposure to government bonds and ILBs and more exposure to corporate credit, returned 348bps in January. · The US debt ceiling, which looked like a contained issue a month ago, takes on added importance in the current volatile market environment. · Over the past month, economic data have been mixed, but key data points including the December employment report and the January ISM report, released on Feb. 1, were much weaker than expected. Weather was a factor in both reports, and rebounds could follow. The US Economic Surprise Index was very strong in early January, but has fallen quite sharply since then. The US ISM Manufacturing PMI slumped to 51.3 in January from 56.5 in December, and the New Orders index collapsed to 51.2 from 64.4. At this stage, the US macro data is not providing a clear picture on the economy’ momentum. · Concerns about global deflation continued to rise, with warnings from the IMF and further soft inflation readings in the US, Eurozone, Asia and Canada. Failure of inflation to stabilize and move higher over the next few months could become an increasing concern for financial markets. · Emerging markets will remain a focus in financial markets. Financial conditions have tightened meaningfully in all EM countries and very sharply in countries like Turkey and Brazil. The Peoples’ Bank of China has moved to ease rising funding rates for banks, but this may be a symptom rather than a cure for China’s over-expansion of credit in the shadow banking system. In this environment, industrial commodity prices remain under downward pressure in early 2014. Copper prices have continued to edge down. In a mid-January post on Inflation and Deflation Scenarios, I pointed to Russell Napier’s advice to watch inflation expectations (measured by break-evens), copper prices and credit spreads. In the short time since that post, each of these indicators have moved further toward the outcomes consistent with the deflation scenario. I noted at the time that Risk Balanced portfolios would perform best in the Deflation scenario and that it what happened in January. That prognostication proved half-right. The equity market correction arrived, but it was EM tensions, some weaker than expected economic data, and growing deflation concerns the proved to be the trigger, not the further bond market sell-off that I and many others expected. How deep the current correction in risky assets becomes will depend on whether the concerns that triggered it multiply or diminish in the weeks ahead. The US employment report on February 7 will be the first test, but is unlikely to be decisive. The turmoil in EM, and China in particular, and further evidence on inflation dynamics will be more important. Raising cash was a good strategy in January. If US equities, which broke key support levels on February 3, do not rebound to finish higher this week, raising cash will continue to be a good strategy. Putting that cash to work in top quality corporate bonds may be the best alternative until the situation becomes more settled.